On February 27, longtime Trump lawyer and confidant Michael Cohen delivered damning testimony about President Donald Trump to the House oversight committee. Cohen alleged  that Trump was aware of WikiLeaks’ plan to release hacked emails from the Democratic National Committee, that Trump lied during the campaign about his plans to build a Trump tower in Moscow, and that Trump directed Cohen to repeatedly  pay off women to keep quiet about their sexual relationships with him. Cohen also called  the president a “racist” and a “con man.” Despite the serious criminal  allegations, right-wing media were quick to dismiss and reject Cohen’s testimony. Others in right-wing media branded the hearing a distraction, especially from Trump’s summit  with North Korean dictator Kim Jong Un. Some figures also argued that the Democrats shouldn’t have held the Cohen hearing while Trump was in negotiations with Kim. 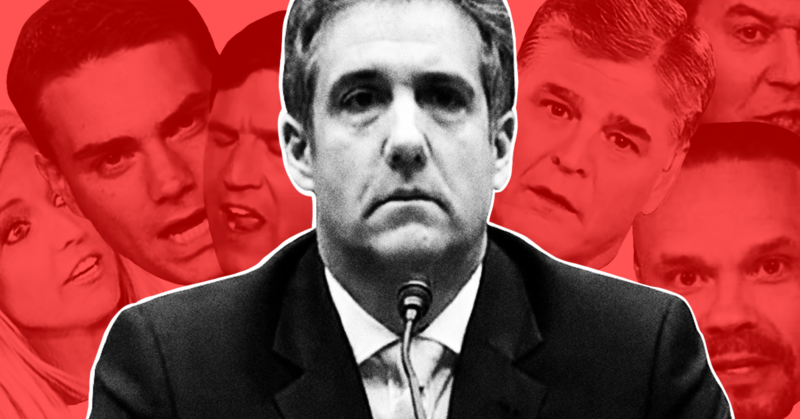 Some right-wing media figures claimed that Cohen’s testimony -- which included allegations that the president committed multiple felonies  -- doesn’t hurt Trump, especially not legally.